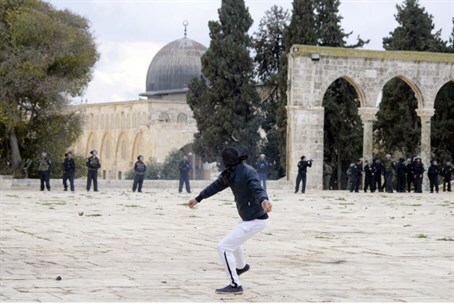 “We will not give up even one grain of Al-Aqsa, since the Jews have no connection to it,” declares head of the Supreme Muslim Council. “Al-Quds (Jerusalem -ed.) is a deposit for the Muslims, and the issue of Al-Aqsa is similar to that of the mosque in Mecca and the Mosque of the Prophet (Muhammad) in Medina, and it is not only in the hands of the inhabitants of Palestine, but in the hands of all Arabs and Muslims,” he added. Sabri placed the blame on any “harm to the sanctity” of Al-Aqsa on the Israeli government, saying that "the daily break-ins by the settlers” into the mosque place it in a dangerous and uncertain position. These alleged “break-ins”, he claimed, aim to impose a new reality while “provoking the feelings of two billion Muslims" worldwide. Sabri’s comments are just the latest in a series of accusations that Arab leaders level at Israel concerning the Temple Mount and the Al-Aqsa Mosque.